Above, Charlton Heston playing Richelieu and inset, George Fraser. 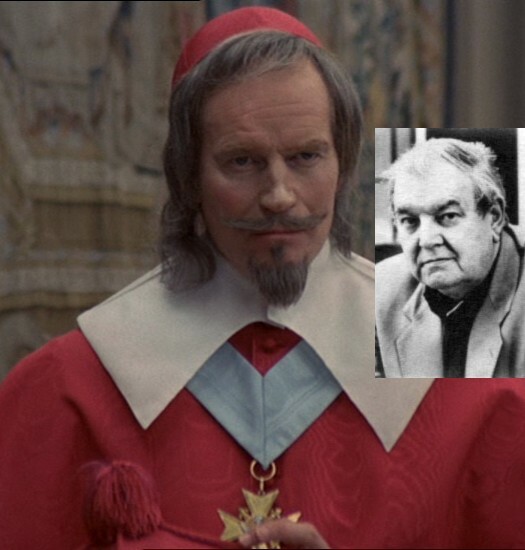 It would be incorrect to attribute the above quote to Cardinal Richelieu. For the very simple fact that there is no evidence whatsoever that he ever made such a pronouncement and plenty of historical evidence to suggest that he would have been most unlikely to do so! The quote was spoken by the actor Charlton Heston in his role as Cardinal Richelieu in the 1974 historical comedy movie, “The Four Musketeers”. The screenwriter of the film was George MacDonald Fraser, OBE, FRSL, so it is to the late Mr Fraser that we should properly attribute the quotation and not Alexandre Dumas, the author of the novel, “The Three Musketeers” as there is no such quote in the text of same. Notwithstanding the obscure origin of the phrase, it nevertheless serves to describe the reality of the governments and parliaments of the EU and it’s remaining members post Brexit to the actions of the UK and statements by various UK politicians. This of course serves to illustrate the fundamental difference that exists between President Trump and such as Chancellor Merkel. One is a billionaire reality TV star elected to the highest office in the USA, the other is a seasoned professional politician in the Western European mold. Today, the excellent Dr. North (http://eureferendum.com/blogview.aspx?blogno=86973) opines upon the collapse of an effective political-media arena in the UK that threatens to have disastrous consequences should a no deal Brexit (NDB) take place – which worryingly increasingly looks more likely by the day! Thus, rather than spend any time about what the UK’s politicians are NOT doing, it may be more profitable and rewarding to speculate upon what EU politicians might be doing! Thus whilst we have a situation where Raab D. Brexit may not think a NDB is that serious a consequence, you can bet your bottom Euro that the bosses of the German automotive industry consider it serious, as will Frau Merkel! The ONE thing that The Chameleon did right was to realise that for him, the political game was up, his goose was cooked and his tenure of 10 Downing Street was about to end! Unfortunately, what he and his fellow Tories did next has proved disastrous! Consider The Chameleon’s position as he stepped over Number 10’s threshold. He had led the Remain campaign. He had “gilded the lilly” about the various options. He had invoked what was known as “Project Fear”. Most importantly of all however, he had made no Plan B! Not only did The Chameleon have to take his own actions (and inactions) into account. He had also to take into account the actions and inactions of the Leave Campaign, particularly the statements made by his fellow Tory, Boris the Buffoon! Instead, The Chameleon demonstrated his inadequacy as a man and as a leader on a truly grand scale and in the most public manner: By resigning on the spot! The situation was made infinitely worse when Madame Mayhem (of whom this organ had initial optimism – that was quickly dispelled) decided to rule out membership of the EEA post Brexit. Now at this point let us be clear: When such as Jacob Ress-Mogg state that the people (who voted “Leave”) voted for a future outside the EU and the EEA he is in fact correct. This is because this was the logical conclusion that a reasonable person would have drawn from the Leave campaign’s statements (both verbal and written). So what Madame Mayhem has done has been to adopt a strategy of implementing the people’s will. There is only one problem with this strategy. It is impossible to achieve! #2 – Pay no more money to the EU. #3 – Reclaim full control over migration and territorial waters. #4 – Achieve #’s 1 to 3 with NO negative economic consequences! Thus, if The Chameleon’s campaign strategy can be termed “Project Fear” the Madame Mayhem’s negotiating strategy can be termed “Project Unicorn”! You see, it is all very well to parade one’s democratic credentials by proclaiming that you will uphold democracy and implement the people’s will – but if it is impossible to do so then you are either a FOOL or a FRAUD! So what The Chameleon should have done was to stand up and apologise for his failure to articulate a realistic Brexit strategy and then to announce that a Royal Commission would be set up ASAP with an independent chairman from the judiciary to put forward a practical Brexit plan ASAP for parliament to deliberate and legislate into effect. This would have bought time, would have obviated the need to submit Article 50 and to set the clock ticking until a proper Brexit plan had been formulated and agreed upon! This is for the simple reason that there is only one practical and doable way of leaving the EU if one does not want to wreck the economy! But as we all know, this did not happen. Instead we have the gigantic coup de théâtre being played out before us! Now let us analyse the statements of one of the actors in this drama: The People’s Vote. Hmm… This statement is in fact rather clever. It is clever because if there is no deal for the government to present to Parliament, there is nothing therefore for Parliament to vote to approve! Thus what the logical outcome of this is that if there is no deal, the choice will be between allowing a no deal Brexit to proceed or that Article 50 should be revoked by repealing the European Union (Notification of Withdrawal) Act 2017 (c. 9) and all subsequent Brexit related legislation! Thus we can see how events MIGHT play out. Should following the European Council meeting in Brussels on Thursday 18th October 2018 such as Donald Tusk announce that negotiations have come to an end and the EU is preparing for a NDB on Friday 29th March 2019, The People’s Vote campaign is likely to demand a referendum on the revocation of Article 50. We can expect many politicians, “celebrities” business people and others to assemble under The People’s Vote banner. Now at this point we can see how the Remainers (Labour and Tory Europhiles) and Remainiacs (Liberal Democrat and SNP Europhiles) have played their cards very cleverly. You see, political campaigns such as referendums, general elections, Police and Crime Commissioner elections, mayoral elections and local council elections are all governed by the Electoral Commission and spending limits! However, if LEGALLY no campaign exists, then there are NO spending limits! Consequently, we can expect to see gargantuan funds being made available to The People’s Vote. This means that the Remainers and Remainiacs – supported of course by the Brussels Brainwashing Commissariat – will be in full scale political manoeuvres free from any and all Electoral Commission rules! So a question is: When will this all kick off? Well, after the announcement that the talks have ended and a NDB awaits is the answer. We have suggested that this could be on Thursday 18th October 2018. The EU and the UK negotiators may however seek to stall this dénouement but at this point in time, we cannot see this dénouement extending into the New Year. This is because the “clock is ticking” not only on the UK’s membership of the EU but also on the period when Article 50 can be revoked! - A referendum decision to that effect. NB: This is of prime importance because the EU would demand a democratic mandate for thios. - Repeal of the European Union (Notification of Withdrawal) Act 2017 (c. 9) and all subsequent Brexit related legislation. - Authorisation of such Article 50 revocation by the European Court of Justice which is the ONLY authority capable of authorising such! - Approval by the EU’s Parliament of the ECJ’s decision. All of the above requires time as does the official second EU referendum campaign! Should this happen and the UK remains in the EU Europhiles will lament upon the “damage” the UK will have done to it’s relations with the other EU member states. This is one thing that British Gazette readers can safely ignore. The EU will be happy that the Brexit issue has been resolved satisfactorily (to them) and all the harsh words from some quarters will be forgotten.